I was hoping to stock the second level of Erdea Manor before posting the third level, but a week of distractions later, and this is what you get. 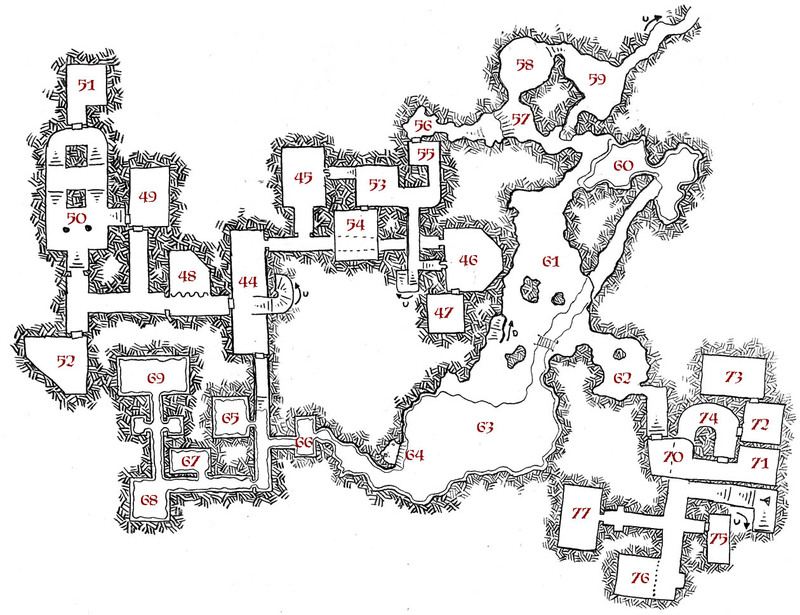 On this level we finally link the side levels from level 1 and level 2 into the main dungeon via the caves in areas 56-63. Also, if the characters didn’t find the secret passages in level 2, if they head through the flooded areas of 65-69, they can eventually find the access to the secret passages through area 56 as rooms 53-55 are all part of that secret sub-complex. And here, in the depths (in the great cave of area 61) we have further stairs down into the lowest level of Erdea Manor – the Catacombs. I’m pushing it to claim this is a post in the A to Z Blogging Challenge – Y is for Yet another level of Erdea Manor. That, my friend, is a frigging Awe-inspiring map…..and its really large, is it based on a graph, or just free handed…? This one is free-handed. The corridors aren’t consistent in width, and the stuff in the lower right is kind of awkwardly assembled. As for large, it is *basically* a full page of good old graphite on plain white paper. Your work, as always, stuns me. Can’t wait to put my hands on the final version and put it in my sandbox!